Hello, everyone! 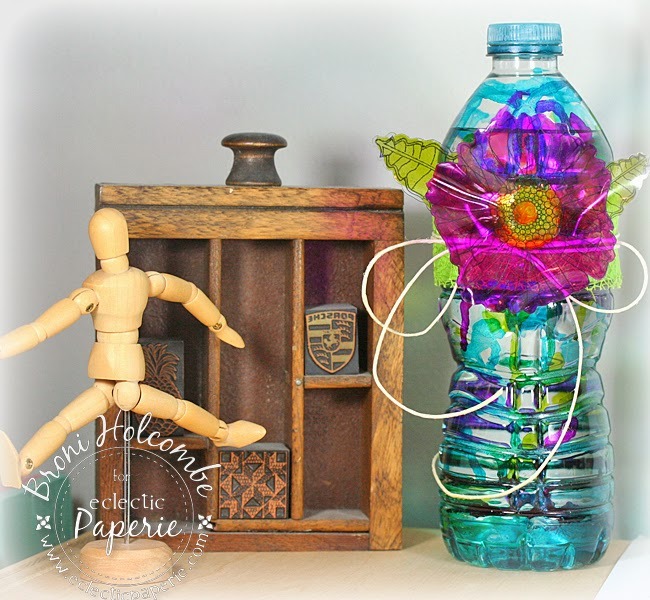 It's Broni here with you today and I'm going to show you what I created for this month's ePlay challenge - Altered Bottles. It's an altered water bottle. When I alter items, I like for them to be useful as well as pleasing to look at! The first "bottle" that came to mind for this project was a water bottle because….well, I was holding one in my hand at the time!! 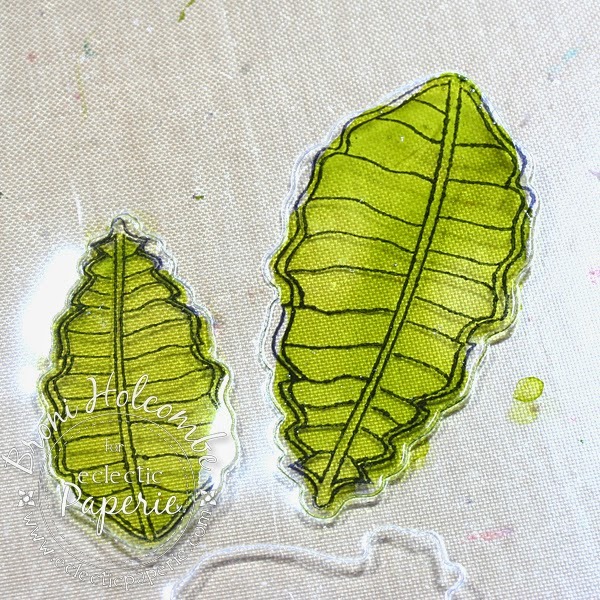 That made me think about how I use water a lot in my crafting: water coloring, filling my mini-mister bottles, wetting my chamois cloth that I use to clean ink from my stamps. And usually when I need more water I get up and go to the kitchen for it. 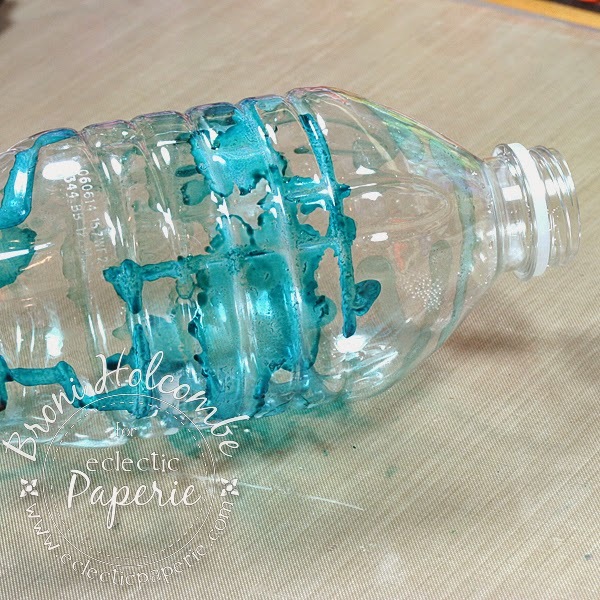 But if I just kept an extra bottle of water on my craft table, I wouldn't have to! Obviously a water bottle is plastic, so that narrowed down my choices of inks to use and I decided on my Adirondack alcohol inks. To start I dripped ink onto the bottle, letting it dry completely between colors so the colors wouldn't become muddy-looking. I used Stream, Lettuce and Wild Plum. Next I cut a flower and leaves (from Friends Til the End by Papertrey Ink) from a sheet of Studio 490 Clearly For Art, but didn't "punch" them from the sheet. 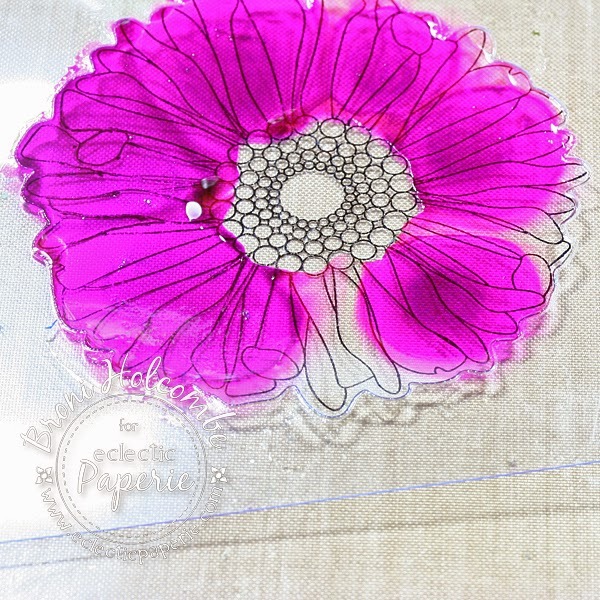 I left them attached in order to have better control over my stamping and coloring. I stamped the images in Archival Jet Black ink. I used a paintbrush to apply some alcohol blending solution, which is clear, to the opposite side of the Clearly For Art sheet from the stamped image. Then I dripped on some Lettuce ink. The blending solution helps the ink flow on the sheet. 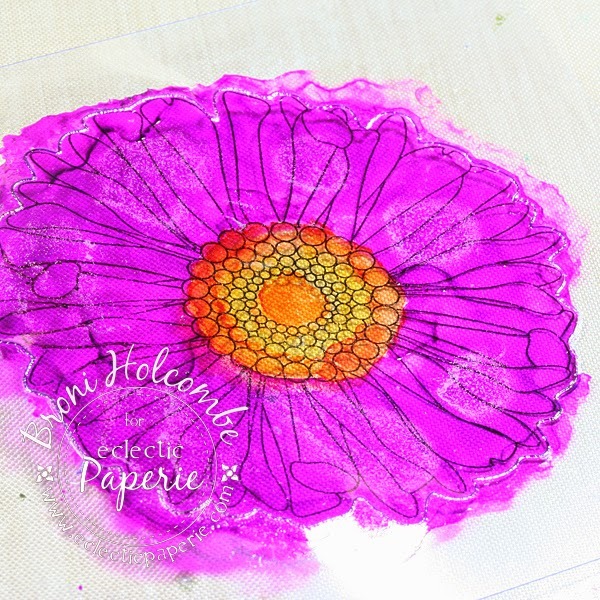 I did the same with the Wild Plum on the flower, only this time I only painted the blending solution on the flower petals so that the ink would not flow into the flower center. I used my Copic markers to color the flower center after the Wild Plum ink was dry. 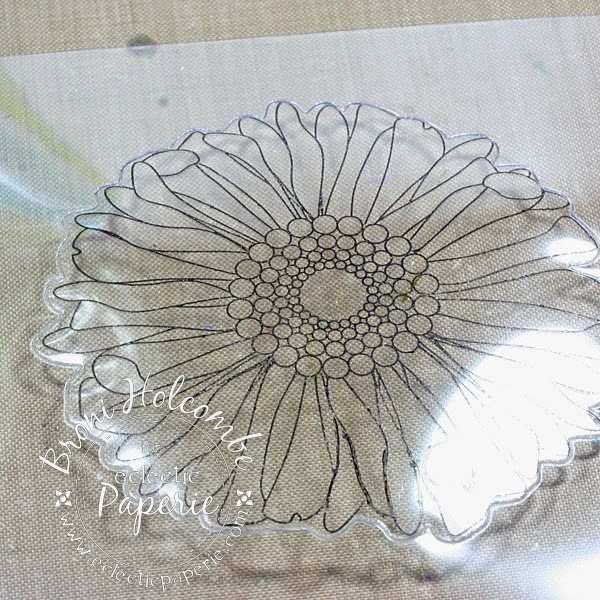 Next I popped the flower and leaves from the Clearly For Art sheet. I wrapped the bottle with a strip of lime green felt. 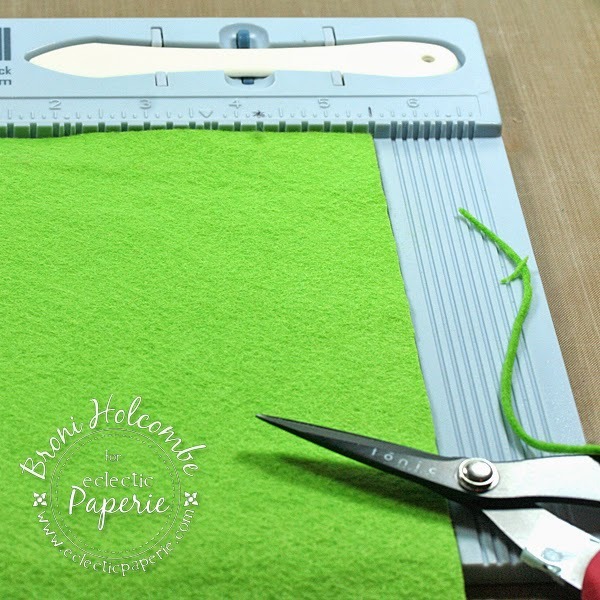 BONUS TIP: To evenly cut the felt, I laid it onto my Scor-Buddy and used my Tonic scissors to cut along one of the score grooves. I adhered the felt, some textured ribbon and some hemp twine using 1" wide Scor-Tape. 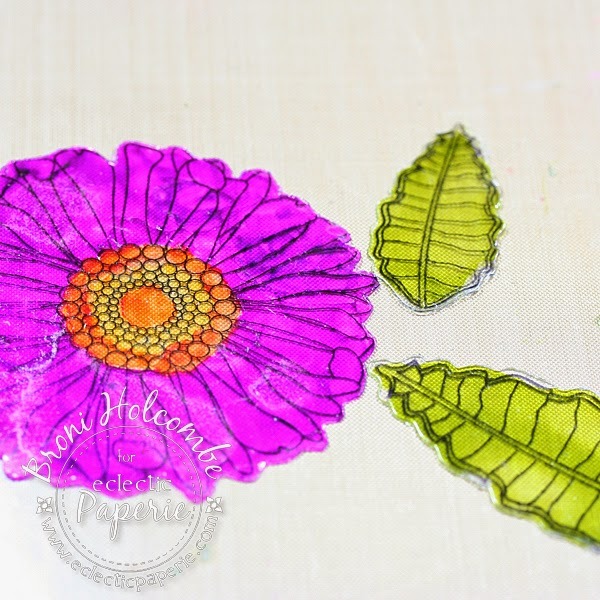 Then I pulled out my Heat tool to warm the Clearly For Art flower and leaves until they were pliable, shaping them with my hands, then adhering them with Scor-Tape as well. It was pretty hard to get photos of a clear bottle filled with water and the shiny and clear flower, but here it is again, along with a close-up and a photo of it sitting on the shelf above my desk. That's it for me today. Thanks so much for stopping by to check out my Altered Bottle. Will you play along in our challenge? Such a beauty and so functional! 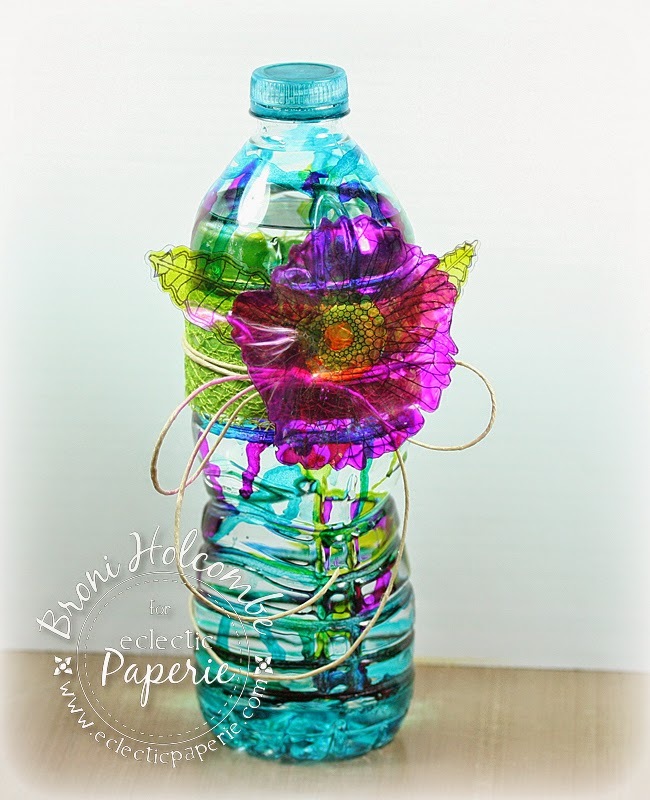 What a beautiful bottle you created Broni! the alcohol inks colored the plastic wonderfully! won't this look great on your work table! So very pretty... that art film is so amazing ! 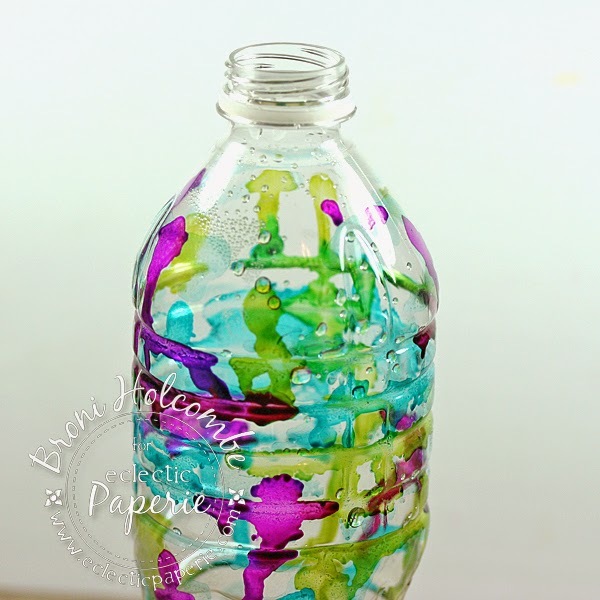 so pretty , love the transparency of the bottle and the film and the vibrancy of colors you have used!! GORGEOUS, Broni! LOVE the color combo and that Beautiful bloom! Holy cow Broni, this is awesome. 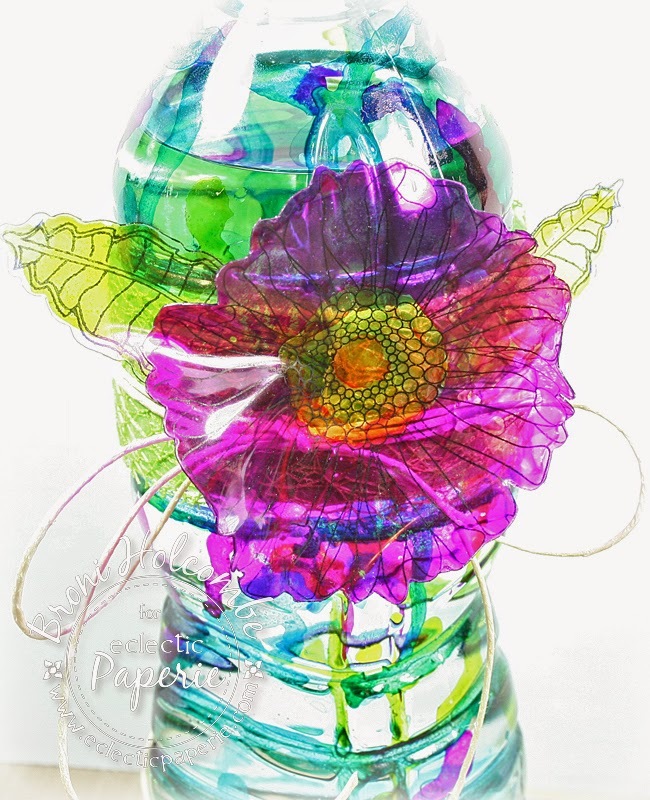 LOVE the vibrancy of the alcohol inks and the flower is gorgeous. 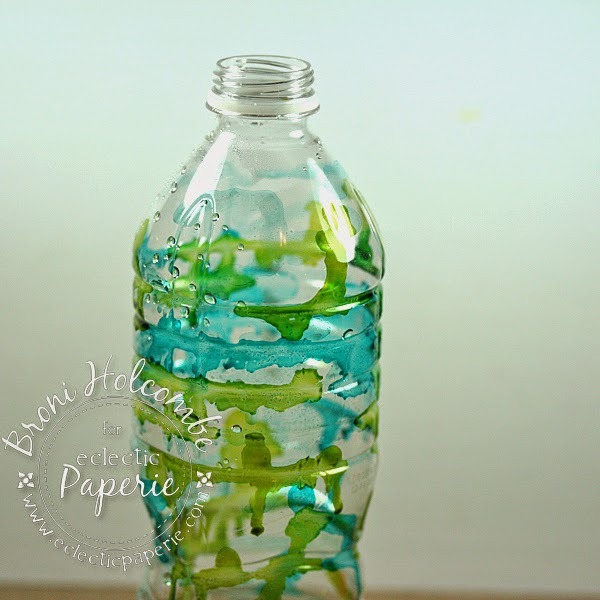 Great idea and since I keep a water bottle on my craft desk, I'm going to get my alcohol inks out and try to replicate. LOVE it.